My previous articles commenced a series on the rapture of the church. We began with the question, "What is the Rapture?" This question can best be answered by noting ten truths about the rapture from 1 Thessalonians 4:13-18 and 1 Corinthians 15:50-58. In previous articles from 1 Thessalonians 4:13-18, we saw that the rapture is an important doctrine and not something that can be marginalized or explained away as a secondary doctrine. We also noted that the rapture is an event that is distinct from the Second Advent of Christ. We further observed that the rapture will involve the catching up of every believer to meet the Lord in the air, and that the rapture will involve a reunion between living and deceased Church-Age believers. We then began to examine several more points from 1 Corinthians 15:50-58. We noted that the rapture will be a resurrection, will exempt an entire generation of believers from death, will be an instantaneous event, is a mystery, is an imminent event, and is also a traditional doctrine now being recovered. We then moved on to our second major question, namely, "when is the rapture?" We noted that as we seek to answer this question, we make no attempt at assigning a date for the rapture. Such a practice is forbidden since the Scripture itself assigns no such date. Rather, here we merely seek to answer the question, "when will the rapture take place with respect to the coming Tribulation period?" After briefly defining the various views that theologians have posited in an attempt to answer this question, we stated that the pretribulation position (the church will be raptured from the earth before the Tribulation period begins) posits seven arguments in its favor. We explained that the first reason that the rapture will take place before the Tribulation period even begins relates to the fact that the Tribulation period itself concerns God's unfinished work with national Israel rather than the church. The second reason relates to the concept of the missing church not only from Revelation 4–22, but also from all central and critical Tribulation texts. While making this second point we further noted that if the church is ever hinted at or mentioned at all in Revelation’s description of the Tribulation period, she is always portrayed as being in heaven and never on the earth. For example, Revelation 1:20 symbolizes the church as seven lampstands. Theses lamps and lampstands are described as already being in heaven before the events of the Tribulation period begin to unfold (Rev. 4:5). "Around the throne were twenty-four thrones; and upon the thrones I saw twenty-four elders sitting, clothed in white garments, and golden crowns on their heads." If it can be established that these twenty-four elders represent the church, then the case for the pretribulational rapture doctrine is further fortified since the Apocalypse presents the church in heaven before the events of the Tribulation takes place on the earth below. "Then one of the elders answered, saying to me, 'These who are clothed in the white robes, who are they, and where have they come from?' I said to him, 'My lord, you know.' And he said to me, 'These are the ones who come out of the great tribulation, and they have washed their robes and made them white in the blood of the Lamb'" (italics added). Since, in these verses, one of the elders inquires into the identification of the Tribulation martyrs, it becomes obvious that the elders and the Tribulation martyrs cannot be one and the same. Some say that the twenty-four elders represent Israel. However, this identification seems unlikely. Once again, the twenty-four elders of Revelation 4:4 already appear resurrected. Believing national Israel will not receive their resurrection until later, just prior to the inauguration of the millennial kingdom (Dan. 12:2; Rev. 20:4). Moreover, while the twenty-four elders are located in heaven in the futuristic section of John's Apocalypse, Israel seems to be fulfilling an earthly role during the Tribulation period (Rev. 7:1-8; 12:1; Gen. 37:9-10). Still others teach that these elders represent the redeemed of all ages, which would encompass those who have trusted in a coming Messiah prior to or even after the conclusion of the Church-Age. Again, this identification seems unlikely since those from non-church age dispensations will receive their resurrected bodies at a later point just prior to the inauguration of the millennial kingdom (Dan. 12:2; Rev. 20:4). "Then I looked, and I heard the voice of many angels around the throne and the living creatures and the elders; and the number of them was myriads of myriads, and thousands of thousands" (italics added). "And all the angels were standing around the throne and around the elders and the four living creatures; and they fell on their faces before the throne and worshiped God" (italics added). Notice that in both of these verses, the angels are mentioned as one category, and the elders are mentioned as a separate category. Such a delineation renders unlikely the notion that the elders are angels. 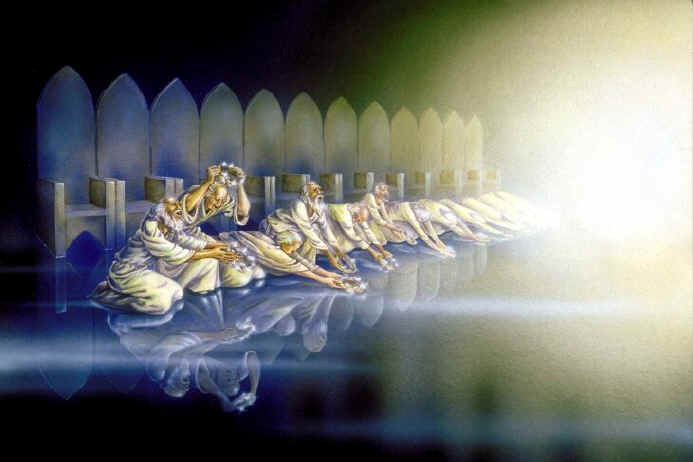 A further problem with the angelic interpretation of the twenty-four elders is that Revelation 4:4 depicts the elders as seated. Angels typically stand rather than sit in God’s presence (Luke 1:19). It seems best to argue that the twenty-four elders represent the church. John describes the twenty-four elders the same way he describes members of the church in Rev 2–3. For example, he notes that they are crowned (Rev. 2:10; 4:10), enthroned (Rev. 3:21; 4:4), and clothed in white (Rev. 3:4; 7:13). Moreover, the New Testament typically uses the designation "elders" (presbyteros) to depict New Testament church leadership (Acts 14:23; 15:6; 20:17; 1 Tim. 4:14; 5:17, 19; Titus 1:5; Jas. 5:14; 1 Pet. 5:1, 5). Why are there only twenty-four elders mentioned? The number twenty-four is used because that is how the Old Testament priesthood was organized (1 Chron. 24). Because the church is similar to (although not identical to) Israel in that the church is also a priesthood (Rev. 1:6), the number twenty-four communicates the church's priestly function. The number twenty-four in Revelation 4:4 is a literal number. John is focused on twenty-four specific elders that seem to represent the church as a whole. However, the number twenty-four simultaneously signifies the spiritual idea of the church's priestly designation. In sum, having previously answered the question, "what is the rapture? ", we noted the first two of at least seven reasons that affirm the pretribulational rapture view. The first reason is that the Tribulation's ultimate purpose concerns Israel rather than the church. The second reason relates to the concept of the missing church not only from Revelation 4–22, but also from all central and critical Tribulation texts. While making this second point, we further noted that if the church is ever hinted at or mentioned at all in Revelation’s description of the Tribulation period, she is always portrayed as being in heaven and never on the earth. This point is heightened when the twenty-four elders of Revelation 4:4 are properly identified as the church. This identification further strengthens the pretribulation rapture position. Before the events of the Tribulation period unfold upon the earth (Rev. 6–19), the Apocalypse depicts the twenty-four elders, representing the church, as already being in heaven before the earthly tribulation judgments even begin (Rev. 4–5). A logical and natural explanation for this location is that the church has already been raptured to heaven before the Tribulation period begins. For these options, I am indebted to J. Carl Laney, Answers to Tough Questions: A Survey of Problem Passages and Issues from Every Book of the Bible (Kregel: Grand Rapids, 1997), 333-34.